Ismaili Center and Museum at Wynford Park in Toronto | Ismaili.NET - Heritage F.I.E.L.D. parking and a central utility plant. garage with a capacity of approximately 300 parking spaces. underground parking will be ventilated, heated, sprinklered, and provided with floor drains. Moriyama & Teshima are the architects of record for the Wynford Park complex of buildings located on a 17-acre site on Wynford Drive in Toronto, and comprising the Aga Khan Museum (design architect Fumihiko Maki with Maki and Associates), and the Ismali Centre and Jamatkhana (design architect Charles Correa Associates), a community/religious centre. Inserted between each of these projects will be a series of landscaped gardens designed by the Beirut-based landscape architect Vladimir Djurovic Landscape Architecture in collaboration with Moriyama & Teshima Planners. Wynford Park will comprise eastern-influenced formal gardens and over two kilometres of walking trails open to the public with five reflecting pools. Visitors will be shielded from the noisy Don Valley Parkway and Eglinton Avenue traffic with numerous places for contemplation. The Aga Khan Museum is dedicated to the preservation of Muslim arts and culture. The museum is an initiative of the Aga Khan Trust for Culture, an agency of the Aga Khan Development Network. It will house collections of Islamic art and heritage, including artefacts from the private collections of His Highness the Aga Khan, the Institute of Ismaili Studies in London, and Prince and Princess Sadruddin Aga Khan. 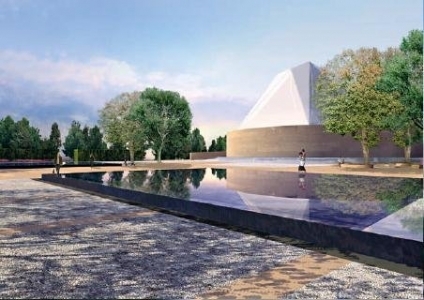 A central feature of the new Museum is an extraordinary, state-of-the-arts Auditorium in which the Aga Khan Foundation will present a music programme to expand knowledge of the traditional music of Asia and the Islamic world. The exhibition includes 215 items from a collection of 1,000 pieces. It will run until June 6th. And eventually move to a permanent home in Toronto, in mid 2013.